Captain Cook Cruises has released cabins for their unique seven night Renmark cruise on the Murray River, aboard the PS Murray Princess. 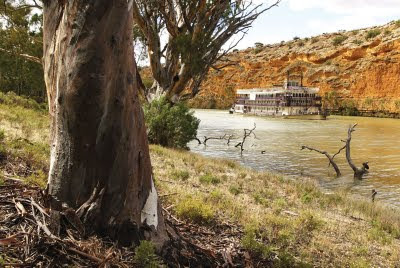 The cruise departs on Monday 22nd November, 2010 and with only two Renmark cruises occurring this year this is the last chance to be a passenger on the historic cruise. The Renmark cruise takes in over 420kms of the Murray River, passing through five locks from Mannum to Renmark which is near the Victorian border. Following in the wake of the great 19th Century pioneers the PS Murray Princess negotiates massive sandbars, hidden reefs and submerged forests on a unique journey that has taken months to prepare. With the Renmark cruise only occurring when river conditions are right, it's the unknown challenges that make this voyage one last great river adventure. Succeed or fail in reaching the destination, passengers will definitely have a whole lot of fun along the way. The Renmark Cruise departs Mannum on Monday 22nd November at 4.30pm with boarding from 2.30pm and disembarking at Renmark on Monday 29th November at 9.00am. Prices start from $1599 per person twin share.